Because I research descendants of my ancestors, I get to learn about a lot more jurisdictions than I would were I to be researching ancestry only. My first cousin three times removed, Clara Josten, married an Alfred C. Jaquith. He was a businessman, and operated in Merrill Wisconsin, Des Moines Iowa, Dubuque Iowa, and Denver Colorado at various times. The Denver Public Library has an index of obituaries that appeared in the Denver Post and Rocky Mountain News, so I knew that Alfred died in late September 1927. I haven’t actually looked up those obituaries yet, and I assumed he’d died in or around Denver. That appears not to be the case, however. 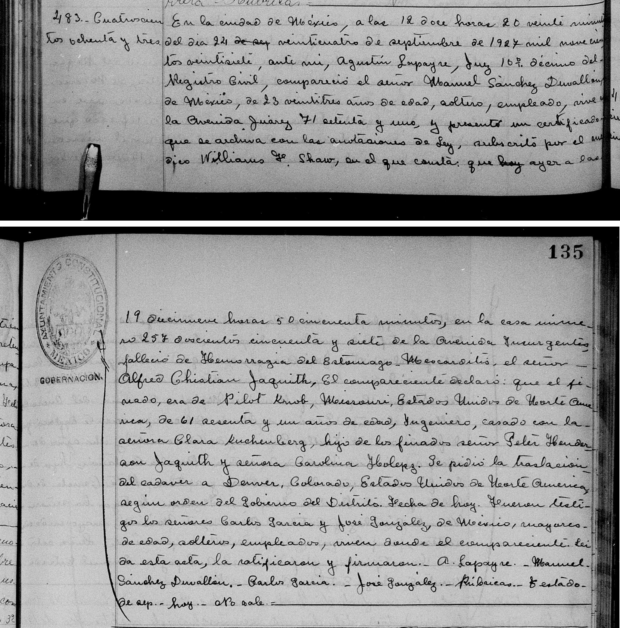 Ancestry.com now has index to civil death registrations from Mexico City, which is based on the death registration images from FamilySearch.org’s Mexico, Distrito Federal, Civil Registration, 1832-2005. FamilySearch’s index does not seem to be as extensive as Ancestry’s. Ancestry’s index led me to this death registration for Alfred Jaquith. It’s the same Alfred Jaquith. While I can’t read Spanish, there are references to Clara Kuchenberg (Clara’s step-father was Mathias Kuchenberg), Denver, and the dates match up with the obituary index. So now I’m going to have to start learning a bit about Mexican genealogy records. Header image Cathedral taken by Jeff Kramer (CC By).